Unlike a hockey player, you don’t have to suffer through gut-busting conditioning drills—but you do have to channel your discipline and motivation in order to bring your talent to bear. If you’re a new freelancer who wants to succeed, or a veteran who needs to deliver some extra oomph, there’s work involved. 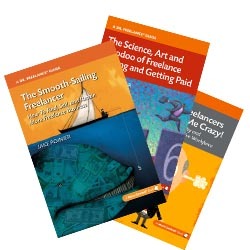 Lori Widmer’s The Worthy Writer’s Guide to Building a Better Business is an excellent place to start, or, for experienced freelancers, to hone your approach. As Dr. Freelance readers know, I’m a fan of Lori’s style and insights on her Words on the Page blog. Her even-handed, thoughtful methodology comes through loud and clear in her ebook, which I’d describe as a blend of pep talk, reality check, self analysis and practical strategy session. The book’s biggest strength, for me, comes from the examples she uses for phone/email scripts (anything to take the dread out of cold calls and followups is OK by me) and particularly for query letters to publications and potential clients. I’ve honestly always felt a bit shortchanged by the samples in Writer’s Market. As a former magazine editor, Lori gives a more thorough treatment of the hows and whys of the component parts, and provides several examples of real letters that landed the job. In a world where some freelance advice comes across as strident, Lori’s vision is much more flexible. You still need to do the work, but she offers a solid plan from which to execute in your own chosen style. Note: I received a complimentary copy of the ebook as the winner of a contest on Lori’s site. But The Worthy Writer’s Guide will surely earn its $11.95 cover price with the first new assignment or fresh strategic idea. I’m glad you found something valuable in it. Coming from you, this is one huge compliment!